The Dakota Access Pipeline (DAPL) was pushed ahead by President Donald Trump on Tuesday, Jan. 24 in a presidential memorandum issued from the White House. The move came after his predecessor, former president Barack Obama ordered the U.S. Army Corp of Engineers to halt construction amid concerns voiced by native tribes and activists about the potential threat to water quality. The pipeline is set to run underneath the Missouri River in North Dakota, the major water source for the Standing Rock Sioux native tribe. The project was initially delayed, with the Obama administration citing the needs for further analysis before the final part of construction under the river could begin. Trump’s memorandum declared his administration’s intention to expedite the review process for the pipeline, forgoing the additional review time Obama thought was necessary. Protests have been ongoing since it was announced that the pipeline would run under the river, in land just north of that belonging to the Sioux tribe. The debate over the pipeline had previously reached Niles West as well. Students in Dena Lichterman‘s Honors American Lit and Composition have led the the opposition within West, at one point even arranging for a petition to be sent to the entire student body. These students first began voicing their opposition to the pipeline out of sympathy for the Native Americans who will be most affected. 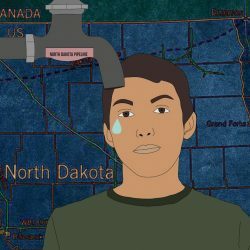 Another of Lichterman’s ALCUSH students cited the importance of stopping the pipeline due to the danger it poses to the communities in North Dakota. Lichterman’s junior classes have continued to bring the issue to the attention of the Niles West community by spreading awareness and working to raise money for the protesters. Several ALCUSH students will be hosting bake sales and puppy chow sales throughout the year to help fundraise money for those protesting the DAPL in North Dakota. Pendavinji also thanked Lichterman for her support and teaching, recognizing that the students wouldn’t be able to accomplish their task without her. Other Niles West students can oppose the DAPL by calling their local representatives, supporting the ALCUSH-led bake-sales, and donating or fundraising money for protesters.